Time for another batch of cell phone pics. 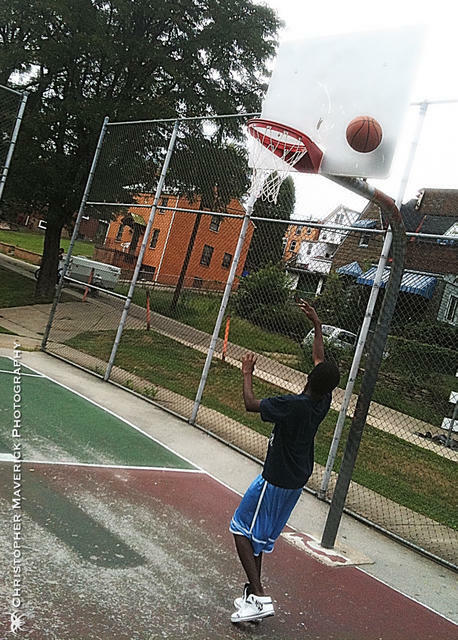 Using a cellphone for sports photography is difficult, but that doesn’t mean it can’t be done. The first key is to get as close to the action as possible. This is not always easy. With traditional cameras, this could be accomplished by using a zoom lens, but since we don’t generally have that option with a cellphone, the only recourse is to actually physically move as close to game as you can. If you have the option of standing on the field of play, as I’m doing here on the August 25th shot, this works best, but obviously that isn’t always possible. Shots that occur closer to the sideline will typically be more engaging than a long shot as the action is that much more immediate. A second thing to keep in mind is that the thing that makes sports photography interesting is action. Try to capture your subjects in motion. Players jumping through the air. Balls in mid flight. Freezing action in times will give your photos a sense of motion that will attract a viewer and make their eyes move through the frame. Sometimes the most interesting photography isn’t representational. An intriguing image can be created merely by capturing an everyday object in a manner it isn’t normally seen, thus creating an abstract piece. With conventional photography this might be done with a macro lens closing in on a subject closer than would normally be seen, but as this isn’t possible with a cellphone, again we simulate it by simply getting as close to the subject as possible while still allowing the camera to focus. 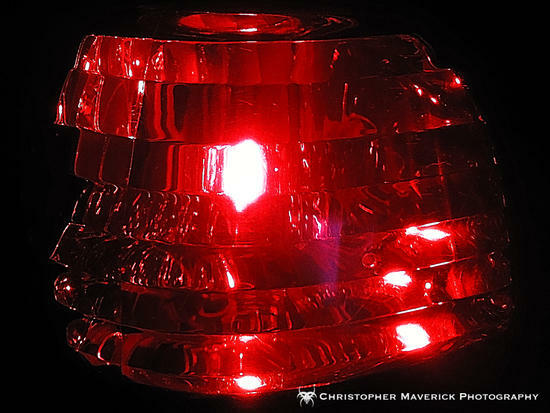 On the August 26th shot, we are looking at the taillight of a car. At this distance we can see the prisms that the light reflects through in exquisite detail as well as see the coloring of the light in vibrant detail. As we’ve discussed before, repetition is often pleasing to the eye of the viewer. Given a repeating pattern that varies slightly will draw the user in as he subconsciously tries to process the scene. This is one of the key secrets to architectural photography. 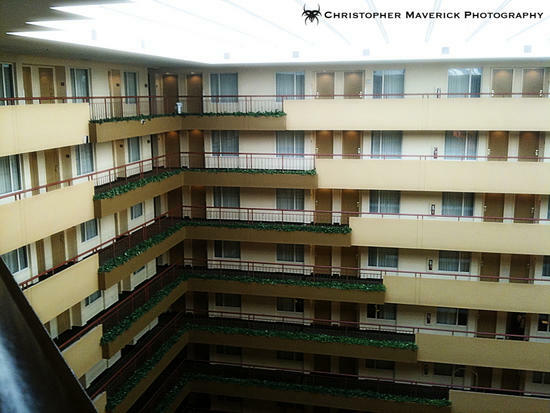 The August 27th shot was taken from the top floor balcony of a hotel looking across the atrium at other balconies on the other side. Several base photography techniques are being used here. Obviosuly repetition is the first. However, I’ve also taken care to make sure that the corner of the hotel falls right on the one-third line, emphasizing the perspective of the left wall and drawing the viewer back further into the frame. Second, the ever expanding mass of greenery slopes downward and caused movement in the photo, as though we were viewing a cascading waterfall rolling through the shot. I decided to feature repetition again on August 28th. 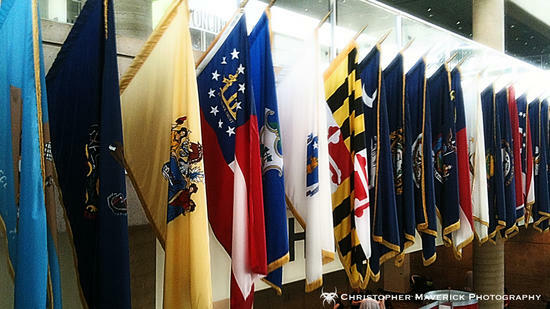 This time we are looking at a collection of flags hanging in the Baltimore Convention Center. The varying colors and designs of the flags create a much more chaotic scene than the total tonal repetition of the building architecture on the 27th, but the similar shape and hang as well, as the clean line and regular spacing nonetheless create a repetitive pattern that allows the viewer to be drawn in to the scene. Way back on Day 4, we discussed child photography and I used a common trick of shooting the subject from above, thus increasing the diminutive nature of the model and creating a since of childlike innocence in the photo. For August 29th, I decided to try a different approach. Contrasting with the previous portrait, for this one I chose to get down at eye level of the subject, an 18 month old girl. This puts the viewer on equal footing with the model and allows us to experience the world as she sees it. a mass of legs and pelvises moving around her barely taking notice. Getting close to the subject also allowed the camera to focus tighly on her, while letting the background elements (people walking by) fall out of the camera’s depth of field. This, paired with the motion blur from the speed at which the background subjects are moving reduces them further into background elements and calls more attention to the primary subject of the little girl. 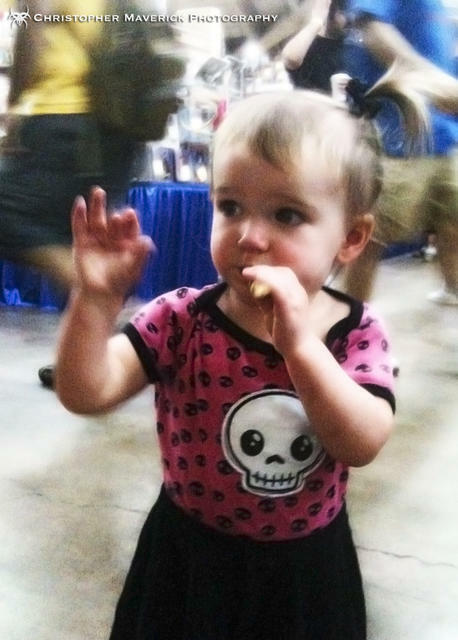 It also helps that she is just unbelievably cute and adorable.